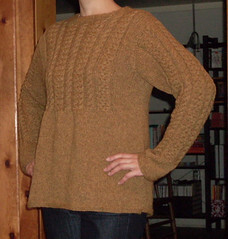 I finished weaving in the ends of this sweater early this afternoon, so I could wear it out running errands. The only mods I made were shortening the sleeves just a tiny bit and knitting four rows of garter stitch at the hem and the sleeves edges to prevent curling. This sweater is very warm, soft, and cozy. I love how it turned out! Beautiful!!! Very impressive. Love the sweater design. if you could email me at mizcoder@clearwire.net...I would really appreciate your comments.